The safety car made an appearance to lead the pack away which was a disappointing start to the British Grand Prix, but the rest of the race delivered some intrigue right to the very end - and beyond! There were tyre choices to be made, puddles to avoid, and spins to try and control with race positions won and lost throughout the race. It went past the end of the race as penalties made a difference to the podium three, but what happened out on track is what matters. If you missed any of the action or want to relive lap by lap coverage of the Silverstone race, read on! Hello fact fans, how's it going? Today is the British Grand Prix and what's that I spy above the Silverstone track? Dark clouds rolling in! Lewis Hamilton has so far dominated proceedings, leading all three practice sessions and snatching pole position yesterday as well. There was a huge crash for Marcus Ericsson during FP3 on Saturday morning, and the Sauber driver was taken to hospital for additional checks after such a big impact. However, he was cleared as fit and has been given permission to start the race. The tyre options available this weekend have moved to the harder end of the spectrum, but drivers chose to bring more soft tyres than anything else, so expect plenty of yellow stripes on show today. Sebastian Vettel qualified well but has to take yet another five place grid penalty, meaning he starts from 11th today. Max Verstappen, on the wet grid: "I’m not doing a rain dance, but it just starts raining, it’s great. 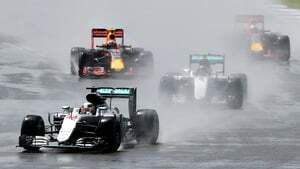 We have more chance in the wet to fight against the Mercedes cars. For us, this is really good. It will be hard to judge what to do, but we try to make the best calls, and the engineers to help me with that a bit as well." It's hammering it down at Silverstone now, the umbrellas are dripping, people are dashing under cover where they can. Carlos Sainz tucked under an umbrella: "Exactly what we needed." Hülkenberg under his own giant umbrella: "I like full wet conditions, so keep it coming, keep it coming." Esteban Gutiérrez sporting a Haas umbrella: "This is going to be exciting, isn't it?" All drivers are safely on the grid, and have been up front for the national anthem. Marcus Ericsson will start the race from the pit lane. It's raining so hard though, we're now all anticipating a safety car start. Tweet from @JRobertsF1: Just ran off the grid after an immense downpour. But to the east it's already brightening up. Tweet from @alanbaldwinf1: There will be no first corner collision between Mercedes drivers. Safety car start. Looks like it has stopped raining for now, there might be more showers coming. Full wet tyres are a requirement as the start is going to be behind the safety car. It also frees up the strategies later if it does dry up, as drivers won't have to use two types of compound. 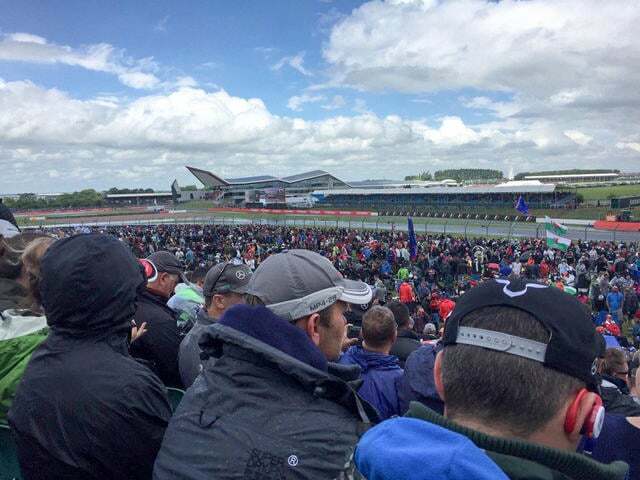 Tweet from @SimonF1twit: we are at Silverstone - it is NOT wet enough for that - GAH!!! Steven at the track: "It's sunny over the grid to Vale but the rest of the track is grey and overcast"
The safety car leads the pack away through the spray. It's damp, but doesn't look like more rain is falling, the sun is out and everything! Just a matter of clearing the standing water. Hamilton is running very closely behind the safety car and complains over the radio that it's not going fast enough. Surely that means conditions are good enough to go without it? Team radio from Sebastian Vettel: "There's quite a bit of standing water around turn eight. Also on the Wellington Straight, down to turn six." One lap down, only 51 more to go. Two laps down, only 50 more to go. Team radio from Lewis Hamilton: "The track's going to be inters pretty soon, I would say." Tweet from @alanbaldwinf1: Hamilton complaining that the Mercedes in front of him is really slow. Team radio from Lewis Hamilton: "We can go, Charlie." But we don't. Another lap begins with the safety car still leading. Replays show Hamilton having to brake sharply to avoid the safety car, as he concentrates on heating up the elements of his car. It's chaos as the pit lane timing screens light up like a Christmas tree. At least ten drivers have dived into the pit lane, intermediate tyres being the choice of the moment. Traffic is clearly an issue, and there was a narrowly avoided incident at the end of the pit lane there. All clear for now though. Hamilton has pulled out a solid lead on the restart, as Rosberg is coming under pressure from Max Verstappen. Räikkönen leads the field further back of those who have pitted for the green stripes. Bottas and Sainz behind him. More drivers into the pit lane on this second time round, Ricciardo leads the way in, with Massa, Button and Palmer following in. Ricciardo manages to squeeze out in front of the Ferrari of Kimi Räikkönen, but the Ferrari is looking to move back alongside. Virtual safety car as Pascal Wehrlein is off in the gravel, having struggled on the intermediates. Team radio from Pascal Wehrlein: "Yea, I'm out. Aquaplaning on the corner. No chance." The top six that hadn't pitted yet have all dived into the pit lane under this virtual safety car period. Mercedes had to stack their drivers, but managed to get them both out in super quick time. They've benefited from the rest of the field going slowly as well. Sergio Pérez has managed to leapfrog his way into fourth by stopping in that third batch. So the lead three remain Hamilton, Rosberg and Verstappen. Pérez in fourth, with Ricciardo managing to keep Räikkönen behind him for now. Vettel started 11th after his five place penalty, and he's now running 12th, having dropped behind the McLaren of Alonso. Hülkenberg attempts a pass on Massa, but has to back off again. He's got two Williams drivers ahead of him, but is now coming under pressure from Alonso behind him as well. Team radio from Marcus Ericsson: "Something is wrong with this engine." Bottas spins off at Vale, he manages to avoid the gravel and rights himself back on track. He blocks Button significantly making his way back onto the racing line. He's 13th now. Ericsson has pulled into the pit lane, the team are looking at the car in the pit box, rather than pulling it into the garage, but it's not looking good for the Sauber driver. Ericsson has rejoined the race, he's down one lap and seeing blue flags already, but there's life in that Sauber yet! Lewis Hamilton sets the fastest lap of the race so far - 1:51.474 as the track starts to dry. Drivers are being warned they need to keep their current intermediate tyres working until it's the right time to change to dry tyres. That's going to be tricky. Hülkenberg dives to the inside of Massa, but heads straight onto a wet patch. The Force India stepped out underneath him so he had to back off and regain control. Replays show Räikkönen running well wide off track, so he's lost a lot of time to Ricciardo now. The gap over 11 seconds between the pair. Meanwhile, at some point, Ericsson came back in to the pit lane and has officially retired now. There's a real train of drivers battling for those final points positions. Massa heads the way as Hülkenberg desperately defends from Alonso whilst still trying to hunt down the Williams. Vettel and Kvyat are not much further behind, either. Team radio to Kevin Magnussen: "How's the track Kev, talk to us?" Sebastian Vettel has come into the pit lane, he's the first to go onto the dry tyres - a set of medium tyres going on that Ferrari. Max Verstappen completed a carbon copy of Hülkenberg's overtaking attempt on Massa, this time on Rosberg. Hit the wet patch of track and had to jink away. Outside of Becketts, Verstappen has another go and this time makes it past - not a usual overtaking place but Max makes it work for 2nd place. Kimi Räikkönen is next into the pits for that medium compound, his stop is a bit slower but he's off again. Having seen the Ferraris coping with the conditions, many drivers follow suit. Bottas, Nasr, Grosjean, and Palmer all dive into the pit lane. Jolyon Palmer was released from his stop but was missing a wheel, so had to be pulled back into the pit box to rectify the situation. Hamilton, Rosberg, Pérez and Ricciardo all come into the pit lane. Verstappen moves into the lead of the race. Palmer rejoins the race, he's got four wheels, but he's last now. Sainz, Hülkenberg, and both McLaren drivers are in to the pit lane for their tyre changes. No position changes for those that pitted though, Hamilton remains in the lead of the field that are on medium compounds. Sebastian Vettel has spun into the grass, but he's back underway now. It's turn one that is still damp and causing issues. Incident involving Jolyon Palmer under investigation - releasing a car in an unsafe condition. Max Verstappen zips in and out of the pit lane to swap to medium compounds and he remains in second place. Yellow flags as Romain Grosjean pulls to a halt off track. More replays of incidents, as Carlos Sainz has a spin, and Daniil Kvyat runs wide across the grass. 10 second stop/go penalty for Jolyon Palmer - releasing a car in an unsafe condition. Palmer heads into the pit lane to take his penalty. Difficult afternoon for the Brit. Fastest lap of the race so far for Max Verstappen: 1:40.747. Fernando Alonso is still hustling to try and create an opportunity for overtaking Felipe Massa. He takes a quick look at the inside line but there's nothing doing yet. Daniel Ricciardo easily passes Sergio Pérez for fourth place. Replays show Max Verstappen rapidly running wide off track but keeping control enough to stay out of the gravel. Team radio from Hamilton: "I want to go to the end on these." Lots of drivers taking to the run off areas as they continue to look for full grip and confidence. Team radio to Jolyon Palmer: "Blue flag for Kvyat." "Ohh, this is a joke!" Yellow flags as Fernando Alonso spins off massively, just touches the barriers, but keeps it going! He's back over the gravel and on the race track to continue onwards. Bottas closes up and takes the long way round on Alonso to try and move past. He hits the puddle and has to drop back running off track. That gives Nasr an opportunity to close up to the Williams driver but it's too wet to try overtaking on this section of track. Another spin! This time it's Sainz who ends up facing the wrong way, and then rights himself to continue onwards. It's turn one that is catching almost everyone out, still wet patches there that are a surprise. Team radio from Fernando Alonso: "I don't know if the car is okay, I guess so." Yellow flags again as Rio Haryanto has run off at turn one, and ended up sideways alongside the gravel. Alonso catches some air... in reverse. Lewis Hamilton struggles at the same spot at turn one, he runs slightly wide but loses only a bit of time as he rejoins unscathed. Max Verstappen did exactly the same thing on the same lap, so Hamilton didn't lose any time from second place during his off track excursion! Rosberg, however, didn't make a mistake and has closed to within 1.1 seconds of Verstappen. Sebastian Vettel takes the inside line and outdrags Daniil Kvyat to move into tenth place. Verstappen gesticulates as he makes his way past Esteban Gutiérrez, the Haas one lap down. Rosberg is closing in rapidly. Team radio from Max Verstappen: "Come on, man, the blue flags are ridiculous." Rosberg has his closest look yet, pulls up alongside Verstappen oh so briefly, before the Red Bull driver darts ahead again. 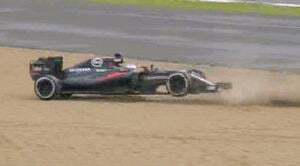 Sergio Pérez has a wonderful sideways drifting moment off track, but keeps it out of the gravel and carries on. He's fifth at the moment. There's a distinctive dry line on the track now, and drivers are wary of running too far off it. Rosberg repeats his attempt on Verstappen, but has to back off again. There's barely more than half a second between them at the moment. The top three have a fifteen second gap over the rest of the field, showing the difference those wet to intermediate tyre decisions made. Rosberg pulls alongside and opts for an outside line around Stowe but he hasn't got the track length to make it stick. He's starting to get frustrated, too, complaining on the radio that his competitor is defending with two moves rather than just one. Team radio from Max Verstappen: "I'm struggling quite a bit with the rear." Every lap sees Rosberg look closer than ever to the car in front, but there's just not enough grunt to make the difference. Sebastian Vettel was making a move on Felipe Massa but couldn't turn into the corner and ran the Williams right off track. He got the position, but that can't last long. Nico Rosberg FINALLY gets the job done on Verstappen, the Red Bull driver doesn't want to give it up but it looks like the Mercedes has the edge as the rear tyres drop off Max's car. Incident involving Sebastian Vettel and Felipe Massa under investigation - forcing another driver off track. Felipe Massa comes into the pit lane from tenth place. Jolyon Palmer back in the pits again, his fourth visit of the afternoon. And he's being pushed into the garage. Race over for the British driver. Fernando Alonso heads into the pit lane for a new set of tyres. Massa took on the softs in a stop that was less-than-stellar from Williams. Alonso has another set of mediums bolted on instead. 5 second time penalty for Sebastian Vettel - forcing another driver off track. And talking of Vettel, he has another wobble off track at turn one - that puddle must be really deep. Now released from Verstappen, Rosberg sets the fastest lap of the race so far with a 1:35.989. Hamilton asks whether the car in front, Felipe Massa, has been shown blue flags, and is informed that he has, at least twice. Kimi Räikkönen is closing towards the rear wing of Sergio Pérez, the gap is down to 1.5 seconds. Räikkönen continues to reel Pérez in lap by lap. He's close enough into Copse, but damp parts of the track limit passing opportunities. Just a few tenths between the two as the Ferrari desperately searches for fifth place. Nico Rosberg has dropped back, is losing time rapidly and Max Verstappen can sense an opportunity to retake his position. It's a gearbox problem, Rosberg reports over the radio, and he's handed an instruction to change modes to help fix it. Is that allowed? Team radio from Nico Rosberg: "Avoid seventh gear." "What does that mean, I have to shift through it?" "A-firm, Nico, shift through it." Whilst watching Rosberg struggle, we missed Räikkönen making the pass on Pérez and moving ahead into fifth place. Paddy Lowe is looking particularly stressed on the pit wall. Rosberg looks like he's found a bit of pace again, and there are just three laps remaining. Verstappen is told the German driver is under investigation for radio instructions though. Incident involving Nico Rosberg will be investigated after the race - radio messages. Lewis Hamilton crosses the line to start his final lap. The crowds are cheering, and he's got a ten second gap to take a comfortable victory. Rosberg manages to keep up the pace and takes second, with Verstappen holding on to third. Hamilton takes a long slow in lap to wave to the cheering crowds and celebrate a home win. The boys head out on the podium, cheers for Verstappen, boos for Rosberg and the crowd losing their mind for Hamilton. The national anthems play out as the track invasion continues, crowds streaming over the tarmac to get closer to the podium ceremony. As the trophies are given out, Rosberg is having a good chat with the Mercedes representative - perhaps being told what's going on with the investigation. Rosberg and Hamilton seem alright together on the podium actually, Lewis gives Nico a good spray of champagne and all three drivers clink bottles in celebration of their achievements. Podium quotes - Lewis Hamilton: "I don’t know if you can be as happy as me. We’ve got the best fans here, thank you so much. Firstly, I’m glad the good English weather came out. We went out and did the formation lap and it was dry, all of a sudden it rained. It was so tricky in those conditions. When we started the race, I was the first to really have to attack it. Tried not to make any mistakes. That’s what I love about this race, it’s never smooth, plain sailing." Podium quotes - Nico Rosberg: "It was a bit of a tricky start. Max got me and it was an exciting race with him. Congrats to Lewis, he did a great job this weekend. Couldn’t reach him, no way. Have to live with second place which is the best we could do today." Podium quotes - Max Verstappen: "It was amazing. First of all, look at the fans, they are great. The race, it was very exciting, very tricky in the beginning. I managed to get past Nico… I think I stopped one lap too late, but then on I just did my own race. Unfortunately Nico got back past but I could still see the top two. Thanks to Red Bull for giving me such a great car, they deserve a lot of credit here." Slightly awkward moment there, when Hamilton praised the British crowds for not booing anyone, and essentially having more class than that. Only for the interview to move on to Rosberg. "Booooooo," goes the crowd. Oops. So it was a good race, in the end, after we'd powered past the stupid safety car period. Some interesting tyre strategies, good overtaking moves, and plenty of pressure throughout the field. Hamilton has once again closed the gap to his teammate in the championship standings, and with momentum on his side, he'll be hoping to overhaul the lead by the time the summer break rolls around. It was another good race for Max Verstappen, the youngster proving his worth in many ways. Another podium position means he's officially out-performed his father, too. Elsewhere, lots of retirements as reliability starts to creep in and become a significant factor. We'll be seeing that more and more as the season unfolds. Difficult day for both Williams and McLaren, but both were expecting it to be challenging regardless of the conditions. Next up, the Hungarian Grand Prix, where we'll do all of this all over again! Until next time, fact fans.